Summary: A new study examines the role TET proteins play in neurogenesis and embryogenesis. Source: La Jolla Institute for Allergy and Immunology. The fate of stem cells is determined by series of choices that sequentially narrow their available options until stem cells’ offspring have found their station and purpose in the body. Their decisions are guided in part by TET proteins rewriting the epigenome, the regulatory layer of chemical flags that adorn the genome and influence gene activity, report researchers at La Jolla Institute for Allergy and Immunology and UC San Diego. Publishing in this week’s Early Edition of the Proceedings of the National Academy of Sciences, the study led by LJI professor Anjana Rao, Ph.D., details how TET proteins help stem cells strike the proper balance between developing into neural tissue or taking the heart and muscle route at an early and crucial intersection. TET proteins influence gene expression by specifically modifying methyl groups attached to cytosine, one of the four letters in DNA. Although these methyl group alterations are important in their own right, they also facilitate the complete removal of methyl groups from cytosine. While methylation and the enzymes required to add methyl groups have been extensively studied as a fundamental force that that helps guide stem cells toward their future lineage during embryonic development, much less is known about the reverse process. Li started his investigations with mouse embryonic stem cells (mES) deficient for Tet3 only, or deficient for all three members (Tet1/2/3) of the Tet protein family. During differentiation, cell types from both mouse strains steered clear from committing to the neuroectodermal lineage, which goes on to form the brain and spinal cord and is considered the “default” pathway for mECs cultured under certain culture conditions. TET proteins helps steer stem cells toward the neuronal lineage during early embryogenesis. Left: Control cells express neuronal markers such as Sox1 (shown in green) and Tuj1 (shown in red). 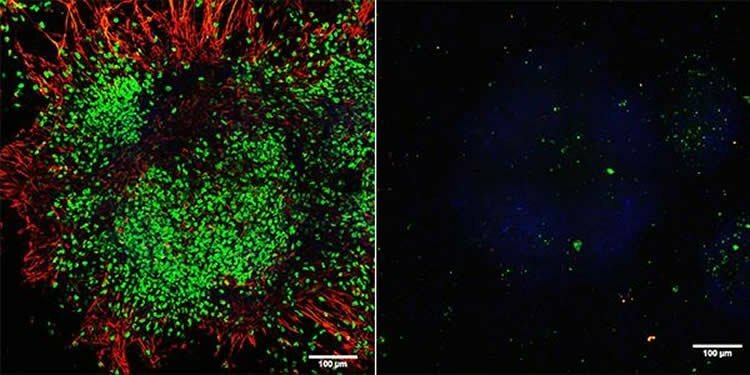 Right: In the absence of TET proteins, stem cells fail to express any neuronal markers. Both: Cell nuclei are shown in blue. NeuroscienceNews.com image is credited to Dr. Xiang Li, La Jolla Institute for Allergy and Immunology. A genome-wide analysis revealed that Tet3 exerts its effect through the inhibition of Wnt-signaling. Wnt signalling is necessary for the proper formation of heart and muscle. “Without Tet3, Wnt signaling is no longer suppressed and can push differentiating stem cells toward a mesodermal cell fate,” explains Li. The mesoderm develops into connective tissue, muscle, bone, as well as the urogenital and circulatory system including the heart. The results from lab-grown mECs prompted the researchers to look for developmental abnormalities in Tet3 and Tet1/2/3-deficient mice. The Tet3 knock-out showed no overt cardiac or neuronal abnormalities, which pointed to functional redundancies between different Tet family members. Tet1/2/3-deficient mice, however, had major defects in neural development, confirming a key role for TET proteins in guiding stem cells down the right path. Funding: The work was partly funded by NIH R01 grants CA151535 and HD065812 and the CIRM UCSD Interdisciplinary Stem Cell Research & Training Grant II (TG2-01154). Image Source: NeuroscienceNews.com image is credited to Dr. Xiang Li, La Jolla Institute for Allergy and Immunology. La Jolla Institute for Allergy and Immunology. “TET Proteins Drive Early Neurogenesis.” NeuroscienceNews. NeuroscienceNews, 6 December 2016. La Jolla Institute for Allergy and Immunology. “TET Proteins Drive Early Neurogenesis.” http://neurosciencenews.com/neurodegenertion-tet-protein-5704/ (accessed December 6, 2016). TET-family dioxygenases catalyze conversion of 5-methylcytosine (5mC) to 5-hydroxymethylcytosine (5hmC) and oxidized methylcytosines in DNA. Here, we show that mouse embryonic stem cells (mESCs), either lacking Tet3 alone or with triple deficiency of Tet1/2/3, displayed impaired adoption of neural cell fate and concomitantly skewed toward cardiac mesodermal fate. Conversely, ectopic expression of Tet3 enhanced neural differentiation and limited cardiac mesoderm specification. Genome-wide analyses showed that Tet3 mediates cell-fate decisions by inhibiting Wnt signaling, partly through promoter demethylation and transcriptional activation of the Wnt inhibitor secreted frizzled-related protein 4 (Sfrp4). Tet1/2/3-deficient embryos (embryonic day 8.0–8.5) showed hyperactivated Wnt signaling, as well as aberrant differentiation of bipotent neuromesodermal progenitors (NMPs) into mesoderm at the expense of neuroectoderm. Our data demonstrate a key role for TET proteins in modulating Wnt signaling and establishing the proper balance between neural and mesodermal cell fate determination in mouse embryos and ESCs.